Only a Pavement Away held its inaugural conference on Tuesday the 19th March. This unique organisation acts as a conduit between charities and hospitality operators with the aim of getting the homeless, ex-veterans and ex-offenders into employment. There are an estimated 32,000 homeless people in the UK and another 5000 who sleep rough every night. The conference saw the industry come together to debate and discuss how as an industry, we can play a major role in the government’s initiative to end rough sleeping by 2027. The event was co-hosted by the Only a Pavement Away charity & by consultancy Think Hospitality. Panellists included industry experts, politicians, leading operators and journalists. It’s a win-win approach. Employers gain access to a previously untapped yet motivated pool of staff who just want to be given a chance to get on in the world of work. They already have tenacity from overcoming hardship, they just need people to believe in them’. Ben Stackhouse, CEO of Pub Love added: ‘By taking a chance on someone and believing in them when nobody else does, you are gaining unrivalled loyalty from that person in return’. In the past, there hasn’t been an organisation which connects charities that deal with the homeless and ex-homeless directly to willing employers. More importantly there haven’t been open roles readily available to these vulnerable individuals….until Only a Pavement Away. During the six-month period that Ed was homeless, when trying to seek help, he never spoke to the same person twice. The process of trying to resolve his situation was extremely disjointed and felt impossible. He stressed: ‘Throwing money at problems does not solve anything. Solutions need to be thought out in advance and the people involved behind the scenes need to cooperate. If not, all the good they are trying to achieve will never happen. He concluded by thanking Only a Pavement Away for thinking differently. ‘Bringing like-minded employers together who can offer us employment gives us hope that we can actually sustain the life we are working so hard to rebuild’. Next to speak was Magistrate David Apparicio, now founder of The Chrysalis Programme, a development course aimed at preventing reoffending. He believes that our justice system is broken because it consists solely of negative reinforcement which alone, will never produce a positive outcome. David went on to tell the story of a man who he once faced in court. The man had stolen a sandwich from a supermarket because he was too broke to buy one. The only punishment David could give him was ironically a £50 fine. As a result of processes like this, ex-offenders often re-offend in order to pay off their sentences and consequently David see’s the same people in court time and time again. Out of the 5000 rough sleepers on UK streets, 1650 of them are ex-offenders. How does this link to our industry and the objective of decreasing homelessness...? Because 75% of people are less likely to re-offend if they get a job. 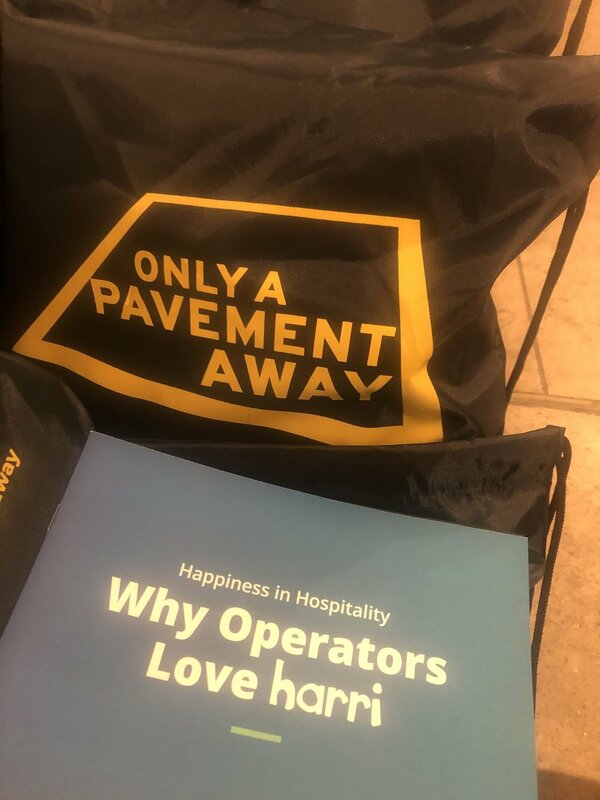 ‘It’s no wonder that Only a Pavement Away have chosen ‘Stability through Employment’ as their mantra. The conference also marked the launch of a new logo for the charity. With help from the Black Arts Company, you will soon see this logo stencilled across the pavements of the UK, reminding us that jobs for people who need them are in fact ‘only a pavement away’. Future objectives of the charity include getting 300 people off the streets in one year and creating training kitchens that homeless people or those in danger of homelessness can access to learn and develop useful skills. This concept ties in nicely with Fred Sirieix who spoke about the idea of treating prisons like schools where life values and skills can be not only taught but developed in the time that would otherwise be wasted. The First Dates and Million Pound Kitchen star drew on his childhood and how great parenting and teaching shaped the person he is today, instilling in him great attitude and values. He concluded by telling the audience that: ‘making the world a better place involves taking action’. When Emma Osborne, Regional CEO of Sodexo Probation and Reemployment asked women prisoners their opinion on going into employment after being released, their response was excitement and delight with the only reservation being apprehension of the interview. Organisations like Only a Pavement Away inform employers of the applicant’s prior situation, therefore questions such as ‘where were you before this?’ can therefore be avoided/ treated with caution. Emma tells the audience that she is a huge advocate of the program but needs to see more jobs being posted. Harri is the applicant tracking system of choice for Only a Pavement Away. We have given our ATS to Greg and his team at no cost, so that employers can post jobs out to the charities that represent the ex-homeless, ex-veterans and ex-offenders. By doing so, we hope to encourage our clients and all other hospitality employers to join the scheme, and post any jobs they think could be applicable to someone trying to rebuild their life and re-integrate into society. It’s important to note that these prisoners have not done anything violent. Crimes such as stealing will have gotten them in trouble, which we are not accepting as OKAY but are simply providing a way for the cycle to be broken and for people to gain back stability. We also want to equip operators with motivated talent so they can fight the ongoing candidate crisis our industry is currently facing. Tim Foster of Yummy Pub Collection has been hiring individuals through homeless charities for a while. With hindsight, Tim tells us that as an employer, getting involved in schemes like this is far from easy because you can never assume things are always okay. Whilst the staff Tim has hired have been hard working and committed, they are all fighting their own inner battles and without continuous support, can feel very overwhelmed by employment. Hearing from The Ivy Collection, Brewhouse Kitchen and Young’s Pubs who have all hired people through Only a Pavement Away, the lesson learnt is that despite all the effort; it HAS been worthwhile. Hospitality is not a job, it’s a career. If we can decrease homelessness, lessen the candidate crisis AND give people lifelong stability…well, then we’re doing something right!